Get ready to save during our BIGGEST sale of the year! Millions of cards will be marked down for this event, but the best deals will go fast, so Register for a free COMC account if you haven’t already and purchase Store Credit. With Store Credit, you’re able to buy deals as you find them and ship when you’re all done. We’re including all new scratch cards with every order placed during the Black Friday Deals event. Only buying a few cards? Get one scratch card! Buying more? Get one scratch card for every 20 cards in your order! If you buy 100 cards, that’s five chances to win up to $100 of COMC STORE CREDIT! Our Shipping Bonus Credit is still in effect. For every 100 cards purchased with Store Credit and mailed out in November, we will credit your account $5 on the first of December. This is your opportunity to be paid to buy big! The free sales promotions will be added to sellers accounts on Monday the 16th, and are available from the Promotions Manager page. Get Ready for Black Friday! We Are Hiring. Our favorite time of year is right around the corner, Black Friday Weekend! There’s no better time to grab those hard-to-find items and sell some cards! We at COMC are getting prepared for our biggest shopping weekend of the year and want to give you the heads up to do the same. 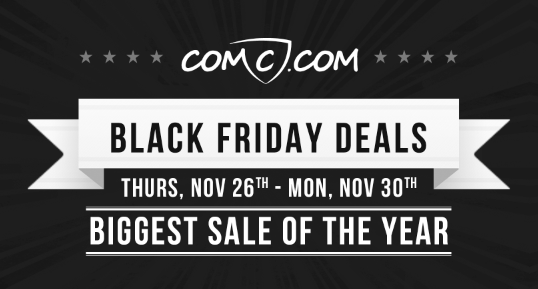 Sellers, mail your items by this Tuesday, September 23rd for the best chance of having them live on COMC.com in time for Black Friday Weekend! Everything we receive by Friday, September 26th should make it up in time. Your cards will get on the site sooner! Your purchases will ship more quickly! The COMC Catalog will build more rapidly! Please recommend all good candidates email hr@comc.com. This full-time position will help us to accurately sort, identify, scan, and organize our incoming inventory. Our ideal candidate will be focused, observant, self-directed, and passionate about all types of collectibles. Processing Team Members deal directly with incoming customer consignment items and coordinate efforts using a sophisticated computer system. Starting salary ranges from $10.00-12.00/hour depending upon experience. After 90 days on the job, employees will be eligible for medical benefits, dental benefits, nearly 4 weeks of PTO/year, and other employee benefits.